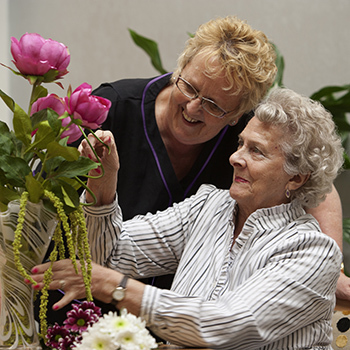 At West Hall we are passionate about what we do and how we care for our residents. We are very proud of our caring team of professionals, dedicated to delivering personally tailored care and ensuring our residents always feel confident that they can rely on a friendly face and helping hand 24-hours a day. Our care home staff are specially selected for their personal qualities, such as being instinctively warm with a natural desire to help – it’s the small things like taking time to have a friendly chat, reminisce or share a joke that make a big difference. All our specially chosen staff are given intensive training in working in a care home and are required to complete NVQ qualifications as well as a range of in-house courses to ensure all residents receive the best possible care. At West Hall all members of the care home team, from our care managers to our administrators, are focused on ensuring all of our residents feel comfortable and happy at all times, and upholding the respect and dignity of everyone in our care.